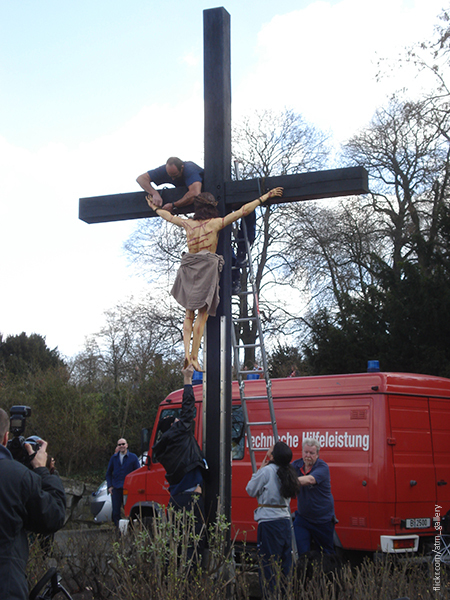 Jesus Christ is hanging on top of the Kreuzberg, life sized and with his crown of thorns. In a cloak-and-dagger operation, the sculpture was placed on the wooden cross of the memorial commemorating the Workers uprising on June 17th. 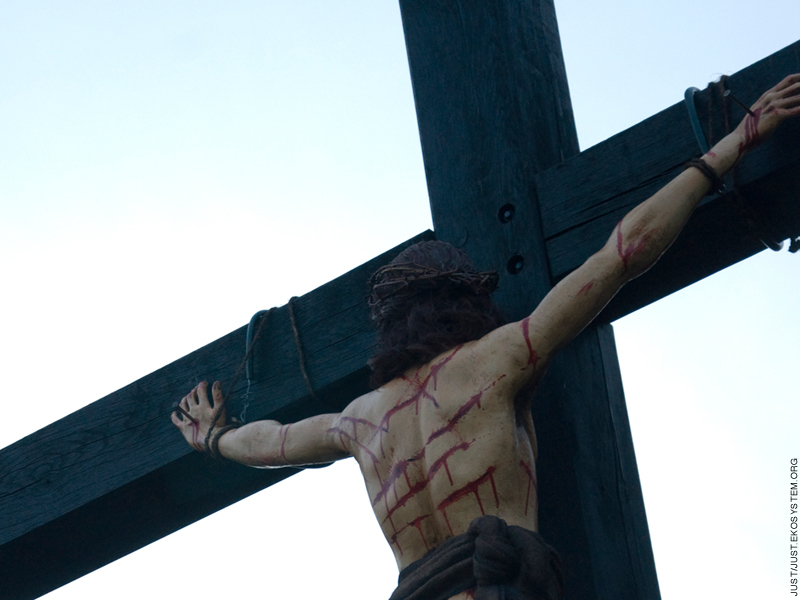 One can see the bloody wounds from his flagellation on Jesus’ back, as the statue has been crucified with his back, and not face, to the observer. This simple misrepresentation, perversion catches the eye, as an “error” compared to the usual representation. This according to the motto “If you are right, you are wrong”. 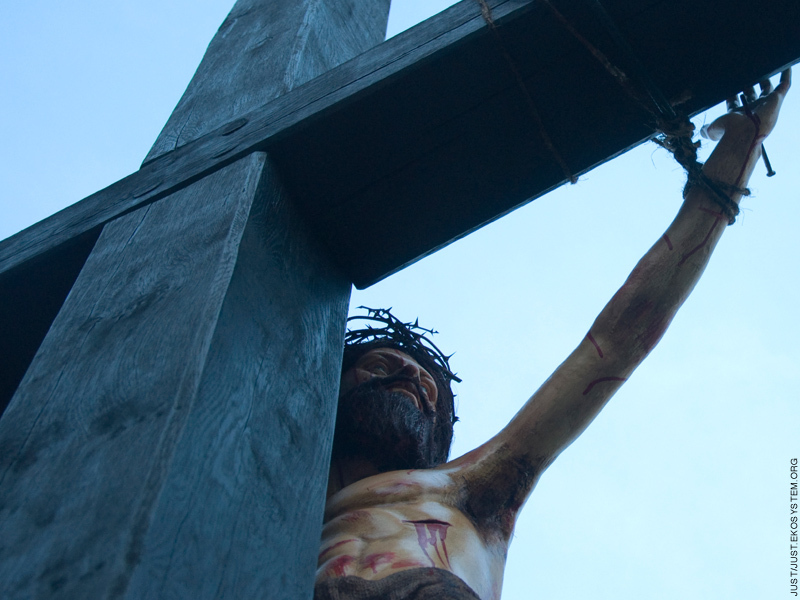 Through this sculpture, we crucifiers – an “urban sculptor Emess” and a self designated errorist – claim to have fulfilled Jesus’ last wish, to be crucified with his face to the cross. Whether this assertion is true, that it was Jesus’ last wish to be nailed to the cross the wrong way round, is a matter of faith. In this way, this action, this artistic intervention, picks up and provokes the idea of „belief“ and „faith“ in institutions such as Art and Church; faith in the image of the redeemer, and faith in the sanctity of Art. We do not intend for Jesus to be ridiculed or mocked. Quite to the contrary, the sculpture intends to highlight the revolutionary side of the radical preacher and holy anarchist, who did not shy away from conflict with the churches and reigning order of his day. 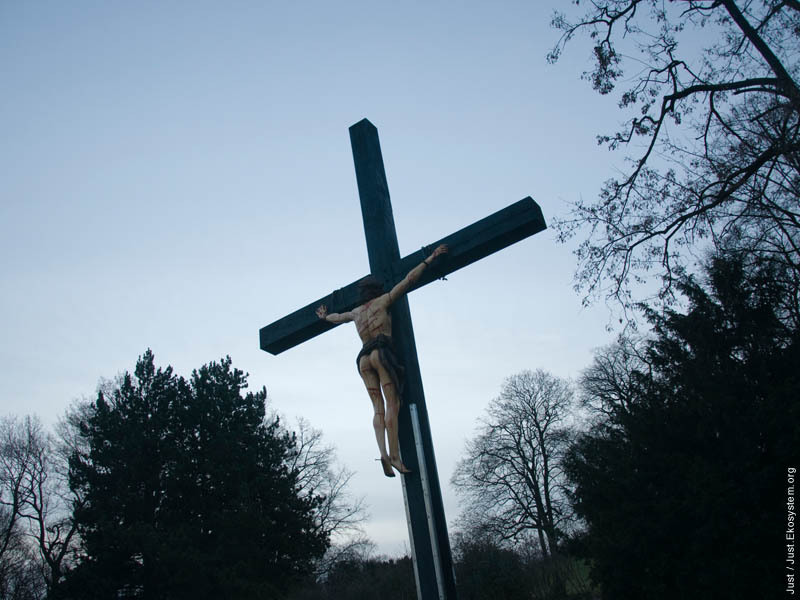 The unauthorised placing of our Jesus sculpture should be seen as an expression of our objection and resistance to the official art industry and the state control of public space.